Annika & Derek’s wedding was full of sunshine and smiles as they wed at the Delta Victoria Ocean Pointe Resort & Spa. 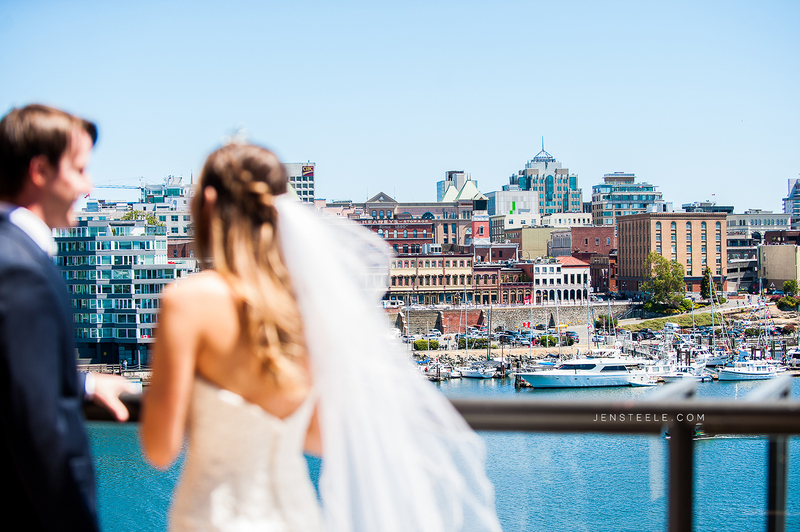 The bride descended the stairs to their ceremony held on the Inner Harbour of Victoria where they exchanged vows and, along with their guests, enjoyed the breathtaking views of the waterfront. The newlyweds, along with their wedding party, took advantage of the natural rocky beachfront alongside the Delta Victoria which resulted in some seriously gorgeous photos by Jen Steele Photography and second shooter, Juliana Wigmore. Anikka fell in love with her gown at Shades of White Bridal and had her floral design by Poppies Floral Art. We loved the combination of blues, purples and mauves that continued through the décor at the reception. Of course, it was a special day for Anikka & Derek but it was also Canada’s 150th Anniversary. The ring shot celebrates both and an added bonus was that everyone was able to enjoy a bird’s eye view of the fireworks on the Inner Harbour. What a way to end the night!